Every winter I am on the Oregon trail for garden scent. My best hope is the Mahonia (aka Oregon grape) which grows very well in various shady parts of my garden and flowers profusely in winter. Regrettably I find the much acclaimed scent is hard to detect but smell is not the only thing that gets up my nose! The rigid leaves have several vicious points on the arrayed leaves and catch me out many times a year. This is partly due to a 6 foot shrub near my Japanese garden path. I don’t know what made me think Mahonia was suitable in a Japanese garden but there you go. As a deterrent to uninvited visitors the prickles make it as good as Holly and a close second to Berberis. The stems or branches are an interesting yellow colour but only get seen when pruning. I prune or trim regularly which aims to keep older plants in shape. Other maintenance is minimal as no critters would make a meal of the leathery, spiked leaves. These woodlanders will appreciate a mulch in early spring and a tidy up underneath the main stem. Mahonia x media ‘Charity’, ‘Winter sun’ and ‘Lionel Fortescue’ These have large upright yellow, scented flowers. ‘Charity’ can be grown in a north facing spot which makes it a good shrub for a difficult growing area. 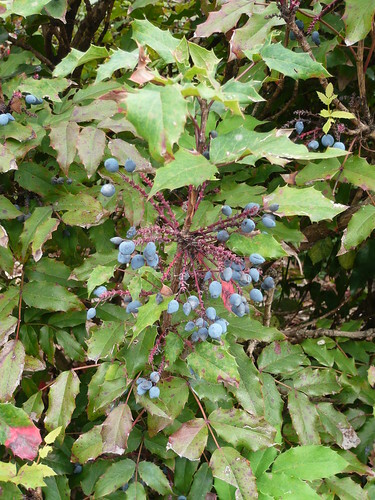 Mahonia aquifolium known as the Oregon Grape is very hardy flowering in March and April followed by blue black berries. 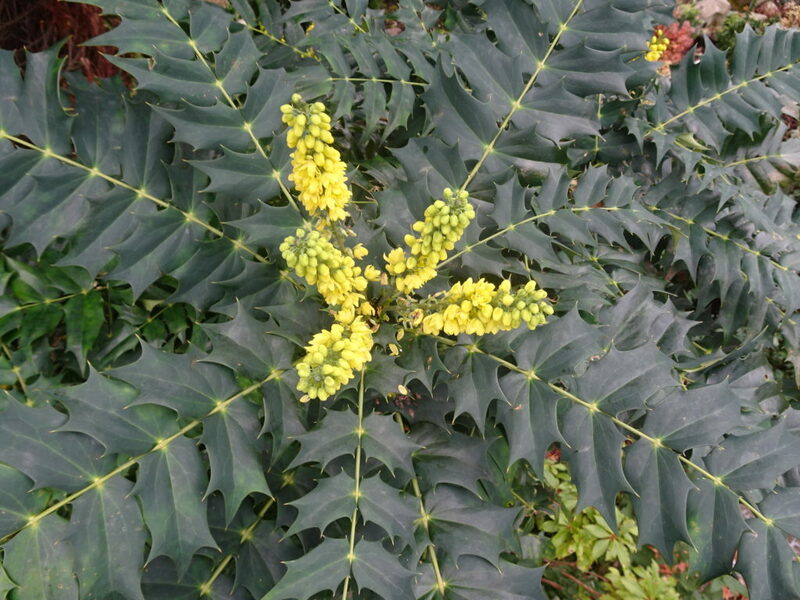 Mahonia x media Underway AGM a tall grower reaching up to 3m with large erect spikes of fragrant yellow flowers in the winter. Mahonia japonica a mid sized shrub growing up to 2m. One to look out for is a new red flowering Mahonia called Mahonia nitens ‘Cabaret’ . The small purplish-black fruits, which are quite tart and contain large seeds can be eaten in small quantities. The fruit are sometimes used to make jelly or mixed with berries from Gaultheria. The inner bark and larger stems and roots of Oregon-grape yields a yellow dye. The berries can produce a purple dye. The foliage is sometimes used by florists for greenery which functions like holly as the leaves remain rigid. If consumed in large quantities berries can cause vomiting, lowered blood pressure, lethargy, and other ill effects. Consumption is not recommended but tinctures and essences are available on the internet.